I began this playthrough of The Sims 4 with two simple rules—Marissa Graham, an ambitious, musically talented woman who wanted nothing more out of life than lots of friends, would have to accept any opportunity that presented itself, and could only purchase items that were necessary to advance her career. Otherwise, her furnished apartment would have to serve the entirety of her life. No repairs unless she undertook them herself. No shopping for new TVs to boost her mood. No paying the bills or rent, unless she could figure out how to do that herself. Marissa Graham, the star of this depressing adventure. By the end of day one, Marissa is off to a good start. She introduces herself to her neighbors, Ray, Geeta, Arun, and Jesminder. She develops an interesting character quirk—an obsession with coffee, to the point that she entirely avoids sleep in order to stay awake and read Love in the Time of Sandwiches no less than three times. She accepts an invitation to the Spice Festival but does not attend, and, when her neighbors are loud all night, she angrily eats yogurt. I decide she has social anxiety. By day two, the temptation to interfere is rising. Marissa ignores a good amount of the objects or interactions she might have with her neighbors, spending the majority of her time watching TV, drinking coffee, and eating yogurt. One neighbor, Raj, barges into her apartment without asking to read her books and sit on her couch. Later, he barges in on her in the bathroom. Neither of them were pleased. Raj refuses to leave. He invites her to see a performer at a festival, but the two of them instead opt to sit around and chat while she’s in her pajamas. She makes a grilled cheese sandwich, and finally seems to warm up to my aspirations for her as a singer—Marissa attempts to wow him with her impressive vocal stylings, and Raj finally makes an excuse to leave, only to return a few hours later. The beginnings of a lifelong friendship. This time, a ghost named Ervin appears, likely because her apartment has the ‘haunted’ trait. The three of them chat, but Ervin, in a fit of possessing objects, breaks Marissa’s toilet and sink. This sets a bad tone—Marissa no longer has a toilet, which means she pees herself on her way to her first day at work, and, instead of forging ahead, she returns home to take a bath. On the upside, she takes the day off to join a protest. Social anxiety aside, Marissa is a woman who cares. Once the protest wraps up, she plays some basketball, orders some vegetarian curry, and goes out with Raj to watch fireworks. Instead, she eats pho and watches a comedian. Raj’s insistence on befriending her makes him impossibly endearing. I’m rooting for these two, as a passive observer—I want nothing more than for the two of them to become friends and maybe romantically involved by the end of her life, and I’m dying to give her the option to flirt. 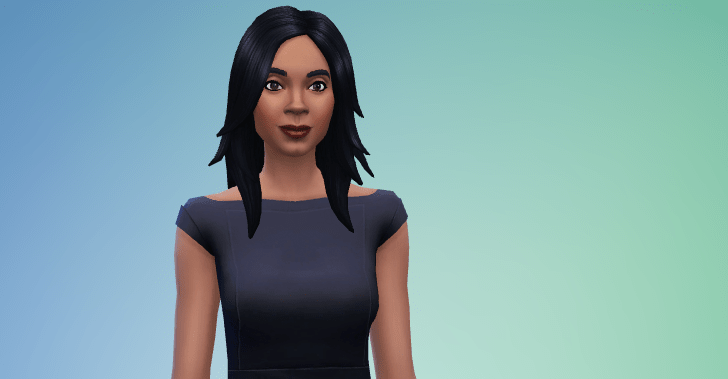 While previous iterations of The Sims allowed characters to flirt with one another on their own, I’m not sure this one, The Sims 4, does; thus far, Marissa’s free will hasn’t encouraged her to do much more than eat and read. She also refuses to leave the festival, instead peeing herself, passing out, and later heckling a living statue only to tip him 13 simoleons of her own free will. Despite all this, Marissa does make it to her first day at work in the entertainer career track. She also gets the notification that rent is due in 24 hours, and I hope that, like previous games, it’ll automatically withdraw from her finances if she doesn’t take the initiative to pay it herself. At the very least, I assume she’ll get a visit from the repo man after a few weeks of not paying. Instead, day six takes a nasty turn. She returns home from work to find one of her neighbors, Geeta, dying in the apartment corridor. I can’t order her to plead with the Grim Reaper for her life, so she just has to stand and stare as Raj weeps over the loss of his mother. The urn for some reason manifests in Marissa’s apartment, and, true to my own rules, I can’t dispose of it. Her hauntings are about to get worse. It’s a different ghost that shows up that night, however. Dennis Kim breaks Marissa’s lone remaining bathroom appliance, her bathtub, but does take out her trash. Moods are about to get considerably more difficult for Marissa to maintain now that she has no power, no tub, and no toilet. Sure enough, she starts off day seven by peeing herself and being unable to shower. Miraculously, she gets a promotion to an open mic singer, and, because she needs it to advance her career, I purchase her a violin. She never picks it up, but she does break her coffeepot. Despite her ability to pee or shower in her own home, Marissa makes an effort to keep it clean. This is the last time she’ll do so—it’s all downhill from this point on, as she’s fighting a constant uphill battle to maintain a good mood. Raj comes over, his mood marked ‘very sad.’ He mourns Geeta. The water is shut off. Interestingly, shutting the water off does make the appliances useable again–despite a ghost breaking the toilet earlier, Marissa can use it now, though she can’t flush. This is an apt metaphor. Day ten, Raj invites Marissa to his birthday party. It’s an absolute blessing, because she gets to take a bath, play with his fancy working toilet, and watch TV. Raj, presumably feeling grateful for her friendship on his first birthday without his mother, tries to hug her—she shoots him down, playing a phone game instead. It’s the first time I’ve thought of her as selfish. Maybe we can ascribe that to her poor mood, her bad situation, her social anxiety. Still, a nice conversation pulls Raj out of his poor mood. But when he makes himself French toast, there’s none for her. Marissa passes out, ages up, and gets sad because nobody threw her a party. Though she’s still sad about her birthday, she goes to GeekCon with Raj. Rather than engaging in any positive activities, she sings karaoke to an empty room, sits alone at the bar for several hours, and is inexplicably very rude to Myra Ramesh. It’s at this point that the game, 12 days in, starts giving me an ever-growing sense of sadness. I feel bad about letting Marissa live such an awful life—if I were any kind of responsible Sims player, I’d encourage her to have a good day. I’d make her pay her bills, at least, and call a repair person for the broken appliances. Maybe then she’d have some positive interactions and pull out of her slump. But I’ve committed, no matter how dull and sad each passing day becomes. By day 15, she’s complaining to her landlord about the lack of water. She fixes the garbage chute by herself, but has no water to shower afterward. Thankfully, the next day someone invites her to the park, which has a very nicely decorated house, including a claw-foot tub. She bathes, and spends the rest of the evening stargazing and napping on a park bench. She watches the sunrise over a bowl of cereal, and caught up in the game’s narrative, I wonder if this will be the moment things turn around for her. Nothing happens for several days. Her last adult birthday arrives, and she and Raj, who has aged up to elder, share some sad conversations. I want nothing more than for these two characters to be happy, but all I can do is watch them read books in her smelly apartment. Nobody celebrates her birthday when she ages up to elder, and she crawls into bed and cries for several hours. Things get increasingly more sad, not for Marissa, but for me. I start to notice little things, like the landlord being replaced by a younger man. When I look through her list of acquaintances, most are ghosts. When you reach elder stage, the life progress bar serves a different purpose, showing how many days have passed rather than how many days are left. Death can strike at any moment, and I feel increasingly guilty for giving Marissa such an awful life in the name of experimentation. Day 26, Raj comes over in a bad mood. Marissa gets a notification that these are her final days, encouraging her to make the most of them, so she and Raj attend GeekCon together again. Instead of getting t-shirts, as they agreed to do, Marissa uses the toilet three times in a row and proceeds to have several drinks punctuated by repeated toilet visits. 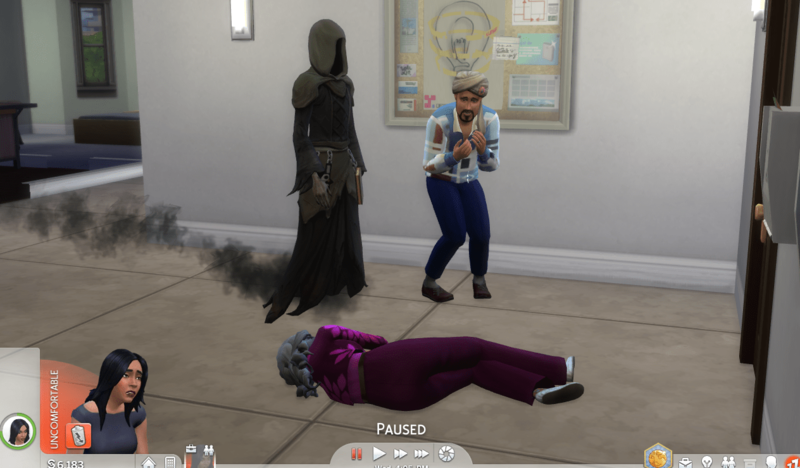 At some point, Death arrives to order his own drink; it’s an ominous scene, my depressed, aging sim seated at a bar, drinking with the Grim Reaper. I don’t have much hope for how much longer this playthrough is going to go on. She returns home, and finds that Raj has died outside of his apartment. I gasped aloud—not only had I not expected that he’d go before she did, given his relatively more comfortable life, but I was legitimately sad to see it happen. He’d been her sole friend throughout this awful journey, the two of them becoming friends despite death and sadness and generally awful things happening on a constant basis. His urn is moved into her house, alongside Geeta’s, a constant reminder of what she’s lost. I knew it wouldn’t be long. Marissa’s other friendships are based around minutes of conversation. Her apartment is filthy, her appliances broken, her water and power shut off. Her life bar starts to glow, an indicator that her life is at its end. She receives a phone call from Alexander Goth, asking to hang out. She accepts, but instead takes a nap. While sleeping, she comes up with her own idea for what to do next—she wants to mourn Raj. Except when she wakes up, she dies. There’s no big pomp and circumstance over it. Music plays, a purple glow appears around her, and she simply lays down on the floor. The Grim Reaper appears, consults his tablet, and lets a few minutes pass as if he’s waiting for someone to come and plead for her life, but the only person who would care is in an urn in the next room. With one swing of his scythe, the Reaper takes her soul. Triumphant music plays, telling me I’ve earned an achievement for getting a Sim all the way to the end of her life. I don’t feel particularly triumphant about it, despite the fact that, logically, I know this an experiment in playing games against the grain, not a real person whose life I’ve mangled with my refusal to help. I feel guilty, like my lack of interference has sentenced her to an empty life of unhappiness. Until, out of curiosity, I open up her statistics. Marissa was happy 52 times, sad 11. She was uncomfortable most often—an incredible 432 times—but she was playful, energized, flirty, confident, and inspired, too. Her sadness was my projection, not hers. 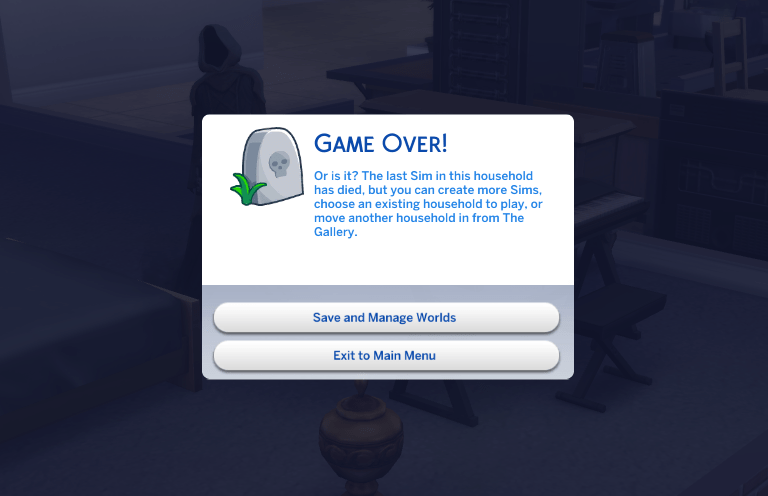 This was easily the saddest game of The Sims 4 I’ve ever played. I’ve made no secret of my lurid, drama-filled playthroughs of yesteryear, but none, even the ones where I’ve failed, have left me feeling so down as this one. Even though the sum of Marissa’s life wasn’t sadness, I can’t help but focus on how I could have improved it, even with just a few gentle nudges to pay the bills or call a repairman. Maybe there’s a grand statement to be made here about how help can get us through adversity, or about how the way we perceive somebody’s existence may not be true to how they experience it. If nothing else, it’s proof that, limited Free Will mode or no, The Sims 4 is adept at creating narratives where none may exist. Read the rest of the Idle Animations series.